Caipirinha is Brazil's national cocktail, made with cachaça, sugar and limes. Cachaça is Brazil's most common distilled alcoholic beverage. While both rum and cachaça are made from sugarcane-derived products, most rum is made from molasses. Specifically with cachaça, the alcohol results from the fermentation of sugarcane juice that is afterwards distilled. Left: Caipirinha, national cocktail of Brazil. The word "caipirinha" is the diminutive version of the word "caipira", which refers to someone from the countryside, being an almost exact equivalent of the American English hillbilly. However, a Brazilian hardly ever thinks of a "country person" when ordering a "Caipirinha". 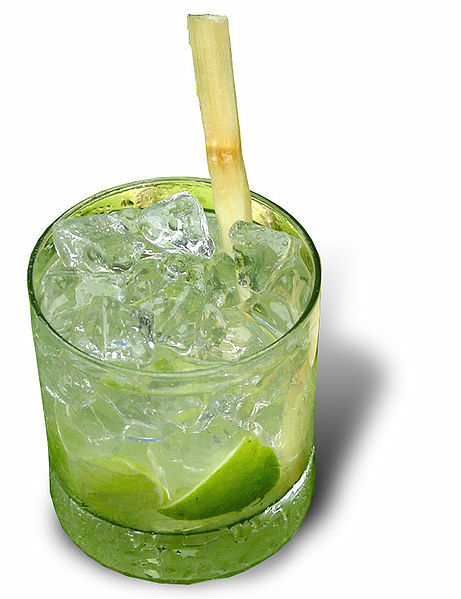 In the mind of a Brazilian, the word "Caipirinha" is mostly associated with the drink itself. The Caipirinha is made from cachaça, lemon, sugar, and ice. A wide variety of fresh fruits can be used in place of limes. In the absence of cachaça, vodka can be used. Use a long glass, or a fat short (wiskey type) glass. Cut lime into 4 pieces. Crush lime and sugar together. Pour a lot of ice.